Everybody gets excited about Junior Journey, grades K-5th love coming to Junior Journey. 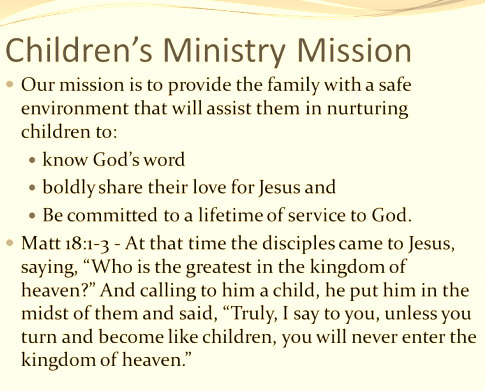 Our Children's Ministers, Jeff & Dawn McCoy, have been doing Children's Ministry at Guntersville Church of Christ for 5 years. They were the ones who took on the role of getting the Lads to Leaders program started. All of the teachers for junior journey volunteer. The plan for Junior Journey is for everyone who starts the program in Kindergarten to cover the Old and New Testament stories three times by the time they complete 5th grade. Sunday morning teachers teach the Old Testament. Wednesday night teachers teach the New Testament. The teachers plan a bible study and an activity for the kids each time they meet. Each month the kids see the story come to life by going to classes that teach the lessons in many different ways. On Sundays the lessons are seen by attending a Drama, Arts & Crafts, Video/Puppet, or Computer class. On Wednesdays the lesson are taught through Music, Missions and Service, and Games and Activities. Junior Journey is lots of fun for our Kindergarten through 5th Grade students. The upper room / gym/teen room is for 6th grade through college. Our teen room minister is Craig Chandler. He is an awesome youth minster!!!!!! He plans the lessons for Wednesday and Sunday. He plans our youth activities and takes us on our youth trips. These programs help everyone want to say, "HERE AM I, SEND ME."